The first releases of these performances on Melodiya drew criticism for their poor sound; there has been an element of cleaning up here by Minuet, but nothing to approach the revitalisation achieved by Pristine Audio, who subjected them to their expert remastering techniques and issued them as part of the set featuring five concertos played by Richter in the 50’s. Pristine’s Andrew Rose managed largely to remove the hiss and papery distortion of the originals and greatly improve the soundscape. I note, too, that the timings on the Pristine issue are somewhat shorter than here, which suggests that Pristine corrected pitch issues, which have remained unaddressed by the Minuet label. Nor is it made very clear anywhere here that these are mono recordings in scrappy sound; you have to look very closely to work that out. Obviously the two concertos also invite comparison with the more celebrated studio accounts, made in the same year and now available on DG Originals. Even the latter are somewhat limited sonically, being a bit wiry, clattery and congested, but they are stereo and clearly provide a superior listening experience. However, one advantage here resides in the superior playing of the Leningrad orchestra. It has been generally agreed that despite the excellence of Richter’s contribution, the Warsaw Philharmonic under Wislocki are sub-par, the woodwind ill-tuned and the strings often wavery and scrawny. Furthermore, the VPO under Karajan were having an off-day and are unexpectedly slapdash; nonetheless, I still find Mravinsky’s direction excessively percussive compared with Karajan’s suavity. 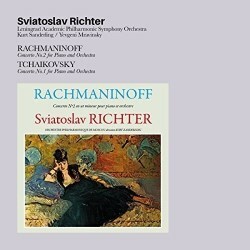 Richter is of course superb in both studio recordings, and we cannot lightly dismiss anything by so great a pianist, especially as so many of the souvenirs of his artistry are perforce in live recordings, as he increasingly eschewed the studio. The affect and timings of his playing of the Rachmaninov concerto are very similar in both versions, but the first two movements of the Tchaikovsky concerto are considerably faster and more propulsive with Mravinsky and I find the first movement to be rather hectic. The bonus is three beautifully played Preludes, recorded live the following year in Carnegie Hall, but, ultimately, I cannot see any great case for desiring this, when you can have both performances in better sound on Pristine (review) or opt for the DG studio recording, great as Richter is in all of them.